Frank Sadecki, the son of Polish immigrant parents, spent his childhood working in the family grocery store rather than playing baseball. As a result, his greatest wish for his son Ray from the beginning was to be “left-handed, (to) like baseball, and become a major leaguer.”1 Frank’s wish was granted as his son, after just a brief minor-league apprenticeship, burst into the big leagues with the St. Louis Cardinals in 1960, the start of a long and successful career in baseball. Sadecki began his professional career with the Winnipeg Goldeyes of the Class C Northern League, posting a 9-7 record. This earned him a promotion to Triple-A Omaha for 1959, where he continued to excel, with a 13-9 record. He began the 1960 season in Triple-A Rochester under manager Clyde King. He was settling in comfortably in the International League, winning two of his first three decisions with a 1.76 earned run average, when the call came from St. Louis manager Solly Hemus. The Cardinals were short on left-handed pitching, and had decided that the 19-year-old had gotten enough minor-league seasoning. Sadecki made his big-league debut on May 19, starting against the Pittsburgh Pirates. He was the losing pitcher as the Pirates won, 8-3. Taken out after 2? innings, he gave up eight hits and five runs, though three were unearned after an infield error. He started again on the 28th against the San Francisco Giants and lost again, 8-0, giving up five runs in six innings. (He was lifted for pinch-hitter Stan Musial.) Sadecki spent the rest of the 1960 season in the starting rotation, alternately dazzling scouts with his fastball and maddening his manager with a troubling lack of control. At year’s end, his record stood at 9-9, with a 3.78 earned-run average, 95 strikeouts, and 86 walks in 157? innings. As a 20-year-old bonus baby on a second-division team, Sadecki was pretty much assured of a spot in the rotation for 1961. He led the team with 222? innings pitched, going 14-10 with a 3.72 ERA. His walks-per-nine-innings ratio dropped from 4.92 in 1960 to 4.13 in 1961, but his strikeout ratio followed a similar trajectory, falling from 5.43 to 4.61. On the strength of this modest success, Sadecki attempted to negotiate for more money in spring training of 1962, and stayed away from camp for several weeks before finally signing on March 2. When the season began, Sadecki’s performance was abysmal. In his seven starts in April and May, he posted an inflated 6.69 ERA, giving up 52 hits and 19 walks in 37? innings, and was bumped from the starting rotation. On June 5 things went from bad to worse. Sadecki came in to pitch the sixth inning against the Cincinnati Reds. Five batters later, he left with an ugly line: zero outs recorded, five runs in on three hits, and two errors of his own. The suspension was lifted, but Sadecki continued to pitch poorly. Over his next 10 appearances, from June 15 to July 28, he allowed an average of more than a hit an inning and walked nearly as many as he struck out, while compiling a 3-5 record and a 4.56 ERA. Keane went from a six-man rotation to four, and Sadecki was exiled to the Atlanta Crackers of the International League. The 1963 season was not an unqualified success, but Sadecki showed improvement in every aspect of his game, including his maturity. His walks-per-nine-innings rate went down, his strikeout rate went up, and he remained in the starting rotation for the entire season. Still only 22 years old, he joined Ernie Broglio, Bob Gibson, and Curt Simmons with double digits in victories (10, against 10 losses). The team finished in second place with 93 wins, six games behind the Los Angeles Dodgers, who won the pennant and World Series. In the offseason Cardinals general manager Devine seriously considered shipping Sadecki to the San Francisco Giants for Felipe Alou, but eventually decided against it. The young pitcher responded in the 1964 pennant chase with one of his best seasons. Starting on May 11 and continuing through mid-June, Sadecki won 10 games in 12 starts, including five complete games. After stumbling slightly in late July, he then put together a streak even more impressive than his first, one that carried him until the end of September. In 15 starts, he won 10 games with a 2.38 ERA, allowing just a .244 batting average against. The 23-year-old got in trouble in the second inning, giving up a two-run homer to Tom Tresh and an RBI single to pitcher Ford. Tresh added another run in the fifth by doubling home Mickey Mantle, giving the visitors a 4-2 lead. Ray’s teammates roared back in the bottom of the sixth, plating four runs and leaving him in line for a victory when he came out in the bottom of the frame. St. Louis went on to win, 9-5; Sadecki gave up four runs on eight hits in six innings, walking five and striking out two. He also started Game Four, but got knocked out after allowing three runs on four hits to the only four batters he faced. The Cardinals came back to win that game, too, and took the Series in seven games. The 1965 season was a reversal of 1964. Sadecki lost 15 games and won only six with a 5.21 earned-run average as the Cardinals fell to seventh place in the ten-team league, though only one game under .500 (80-81). He got off to a slow start, and bounced back and forth between the crowded starting rotation and the bullpen. In the first half of the season he was 2-8 with a 7.20 ERA and gave up 17 home runs in 75 innings. He was better in the second half of the season, going 4-7 with a 3.69 ERA and giving up nine home runs in 97 innings. As a result, he was slotted into the bullpen at the beginning of the 1967 season. By the end of June, however, he’d earned a spot in the rotation, and finished the season strong with six wins in September. For the season, he established career bests in earned-run average, walks and hits per nine innings, strikeouts, and fewest walks per nine innings. With renewed confidence and some success to build on, Sadecki got off to an uncharacteristically hot start in 1968, posting a 0.25 ERA in four April starts. It may have been partly due to a new pitch he had developed before the season, which he described as “a sort of a slip pitch—a half-speed curve, if you want to call it that.”8 Apart from a short midsummer slide, 1968 was Sadecki’s best season statistically—an accomplishment obscured by his record of 12-18. The 18 losses were the most for a pitcher in a season since the Giants moved to San Francisco. Sadecki received shockingly poor run support; in his 36 starts, the Giants scored one or no runs 16 times. Still, he posted career highs in innings pitched (253? ), shutouts (six), and strikeouts (206, a huge leap from his previous high of 145). In 1969 Sadecki pitched two shutouts in his first three starts, but was demoted to long relief after a disastrous May. There he floundered, and after the best earned-run averages of his career in 1967 and 1968, posted a 4.23 ERA in 1969. In December of 1969 Sadecki and outfielder Dave Marshall were traded to the Mets in return for spare parts Bob Heise and Jim Gosger. In New York he was a spot starter and long reliever in 1970, with 19 starts in 28 appearances. He pitched well but found it tough to break into a rotation that included Tom Seaver and Jerry Koosman. After his career ended, Sadecki lamented, “I was 29, feeling good. I’d finally learned how to pitch, but I couldn’t get out on the mound anymore.”9 His overall line in six seasons with the Mets: a 3.36 ERA and 30-25 record in 165 appearances, including 62 starts. He pitched four times in relief for the Mets in the 1973 World Series against the Athletics, allowing one run and five hits while striking out six in 4 2/3 innings. In this context, it is interesting to re-examine two labels that haunted him throughout his career. First, the reputation as a precocious troublemaker, stemming mainly from his troubles in 1962. As a veteran pitcher on a staff full of young talent, Sadecki seemed to grow into the role of Mr. Reliable. Indeed, California Angels general manager Harry Dalton referred to him as a “staff saver” when he tried to trade for him in 1973. Second, the idea that Sadecki was never able to overcome the pressure placed on him after the Cepeda trade, a deal that is often characterized as one of the most lopsided in history. Cepeda went on to lead St. Louis to a pair of pennants in 1967 and 1968, but to relegate Sadecki to the level of an Ernie Broglio or Larry Andersen, pitchers in deals gone sour, is to ignore his yeoman service for a decade in San Francisco and New York. A good example of Sadecki’s utility with the Mets is his 1974 season. When relief ace Tug McGraw struggled in the first half, Yogi Berra plugged Sadecki into the bullpen, where he bent but did not break. Later on, starters George Stone and Craig Swan had arm troubles, and Sadecki was shuffled into the starting rotation, where he ran off four straight wins in August and September. No matter: Sadecki was traded in the offseason to his first team, the Cardinals, in exchange for Joe Torre. Sadecki, who became available after the emergence on the Mets of young pitchers Randy Tate and Hank Webb, was pleased to return to St. Louis, where he could be nearer to his family. Despite this encouraging development, 1975 was a topsy-turvy year for Sadecki. 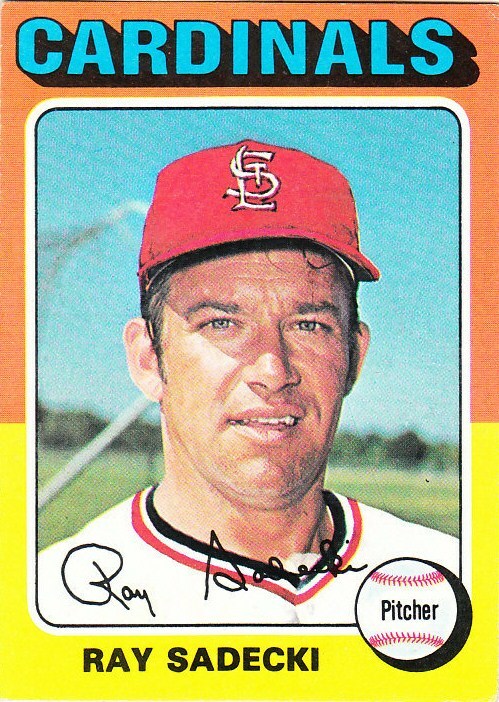 After just eight relief appearances for the Cardinals, he was traded to the Atlanta Braves as part of a package for starting pitcher Ron Reed. By this point Sadecki was 34 years old, with his prime firmly behind him, and he couldn’t have been happy to be traded to a noncontender, away from his family. He appeared in 25 games for the Braves, starting five of them. Then, on September 4, he was gone as quickly as he’d come, completing an earlier trade between the Braves and the Kansas City Royals. Back home again, Sadecki appeared in five games for the Royals at the end of 1975 and three at the beginning of 1976 before being released. He was then signed by Milwaukee and stayed with the Brewers for the remainder of the season. After being released at the end of the 1976 season, Sadecki requested and received a spring-training invitation from the Mets, who were looking for a left-handed specialist in the bullpen. His arrival was cheered in the New York clubhouse, where he remained popular. He made the squad for Opening Day 1977, and pitched four times in April, but was released on May 2 to make room for young right-hander Jackson Todd. The 5-foot-11, 180-pounder left with a major-league record of 135-131 and a career 3.78 earned run average, compiled over 2500? innings spanning 18 seasons. Sadecki worked for an office supply company from 1977 until 1990, then signed on with the Chicago Cubs as a minor-league coach and roving instructor. He worked for Chicago until 1993, then spent a year as a roving instructor for the Giants before leaving that job in the aftermath of the 1994 players strike. (Sadecki called his departure from the Giants a mutual decision, partly because of the economic uncertainty coming out of the strike and partly because he wasn't really in tune with the players – he said he didn’t really understand that the game had changed since he played. Sadecki’s son Steve, born in 1970, played baseball at Vanderbilt and made it as far as Triple-A in the Rangers organization. He also has a daughter, Susan Rae, born in 1966. He was divorced in 1990 and remarried in 1996. On November 17, 2014, Sadecki, 73, died from complications of blood cancer in Mesa, Arizona. 5 Telephone interview with author. 8 The Sporting News, April 13, 1968. 10 Telephone interview with author.